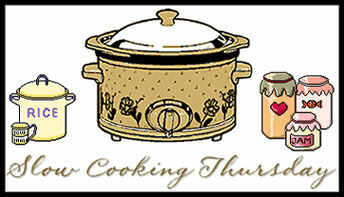 Making a House a Home: SLOW COOKING THURSDAY!!! Yep, it's that time again!! Slow Cooking Thursday!! I always look forward to it. For more slow cooker ideas, visit this blog. Mix first four ingredients together until blended. Pour 1/2 of the mixture into the crock pot and then add the chicken breasts. Top with the remaining mixture. Cover and cook on low 6-8 hours. Serve over your favorite pasta. Oooh, chicken and pasta, I love it!Thanks for sharing. I LOVE this! i just recently started using the slow cooker that was gifted to me at my wedding. nearly 3 years ago!!! Yummmmmmmm. You're making me hungry! chicken and pasta are two of my favorite things! Haha Julieann!! I used to be the SAME way when I was growing up!! Wait... who a I kidding... I was that way until I got married almost 8 years ago! LOL!!! I HATED all mushrooms and Mr. U LOVES them, so I tried to just accept them as long as they were in small pieces!! HAHA!! I finally tried fresh mushrooms this year (sauteed in butter and olive oil!!) and fell in LOVE with them! There is hope for your son! HAHA! Ruth, I LOVE LOVE LOVE my crock-pot!! My mom never used one when we were growing up and then someone gave Mr. U and I one for a wedding gift. I didn't know what to do with it and he thought I was nuts!! HAHA!! Now that I've been using it for all our married life, I cannot see how my mother ever lived without one! This looks great, thank you for sharing. I love crockpot recipes.